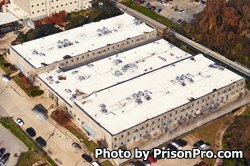 Kegans State Jail is a mixed custody facility that houses short term and transient inmates in Houston Texas. The facility is named after a former state district judge. The current capacity of Kegans State Jail is 667 male offenders. The majority of inmates at Kegans State Jail are low risk non-violent offenders from Harris County. Most inmates at Kegans State Jail are within 120 days of release. Inmates incarcerated at Kegans State Jail are provided adult basic education, literacy and GED courses. Additional programs include substance abuse education, cognitive intervention, job skill/employment preparation, pre-release and prisoner reentry initiative programing. All inmates are provided off site medical and dental treatment. Select offenders can work in supportive positions within the facility providing facility maintenance, and working in a food bank program. A variety of services and planning initiatives are available to all inmates who are nearing discharge, inmates should discuss these options with their counselor/social worker. Inmates located at Kegans State Jail are allowed visits on Saturdays and Sundays from 8am to 5pm. Inmates are allowed one visit per weekend. Visits can be up to two hours long if space and time permits. The inmate's current classification and status will determine if they are eligible for contact or non-contact visits (offenders must be at the facility for 14 business days to qualify for contact visits). Visitors of Kegans State Jail are allowed to bring up to twenty dollars in quarters contained in a small clear Ziploc bag to use in the vending machines. In addition to money, visitors should only bring their car key and identification with them into the facility.